02.04.2017 - Batam. 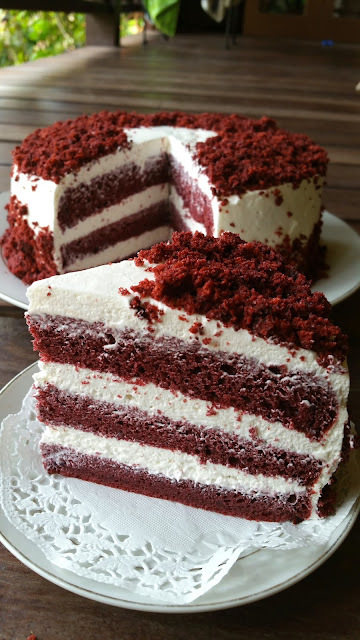 Who haven't try baking this luxury beautiful spongy and delicious "Red Velvet Cake", its time to get yourself to bake one! This is an easy peasy bake. I guaranteed will satisfy your craving! 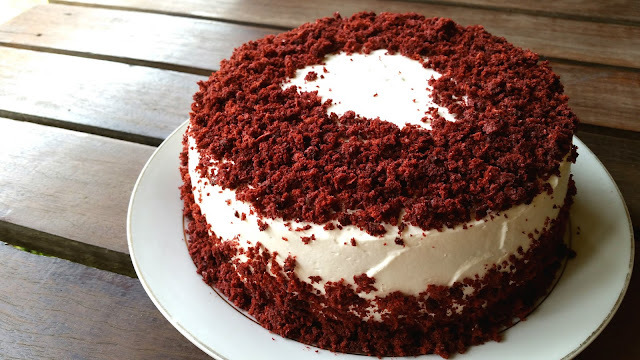 Recipe by https://jeannietay.wordpress.com/2015/12/12/red-velvet-cake/ Do adjust the baking temperature. This is my 2nd Bake, the 2nd was as good as the 1st bake. ITs all always better and if you see my 1st bake, the decoration and cream is so much different, this definitely looks more neat and clean. Its also due to the frosting that using more creamcheese instead of whipped cream. This is a perfect cake for birthday, wedding or served in any occasion. 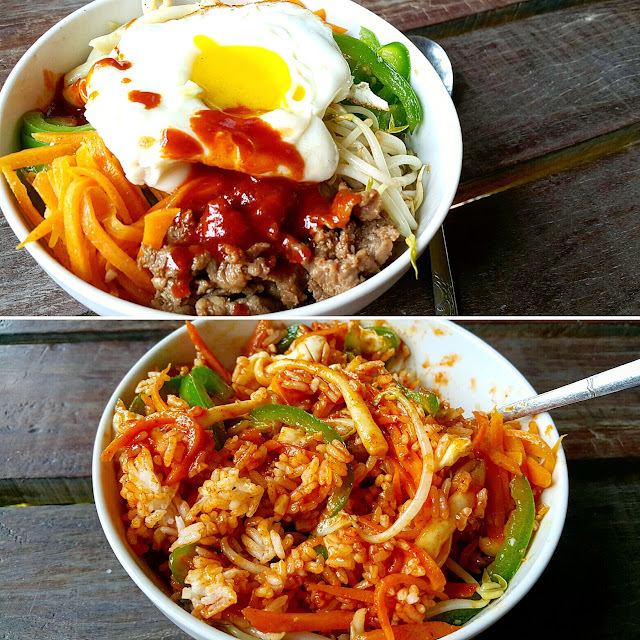 Not only the color so attractive, every bite is magical! * Beat creamcheese, sugar and vanilla until creamy. In another mixing bowl, whip whipping cream till thick and mix cheese to combine. I have tried both Frosting, if u like more cream cheese you can pick Jeannie Tay Frosting, if you like less cheese more cream, you can pick Munira Frosting. * Grease and line bottom 8" round pan ( new pan ), side grease and dusk with flour. * Pre-heat oven 170c with waterbath. * Sift 1st 5 dried ingredients and set aside. * Beat egg whites, sugar and cream of tartar until firm peak and set in the fridge for later use. * Add in egg whites separates into 3 batches, 1st fold in 1/3 portion with hand whisk until all combine, 2nd fold in 1/3 portion mix gently and is ok if u see some meringue not totally mix through but continue add in the last remaining portion, fold with a spatula gently until all combine. * Pour into baking pan, Bake at 150c 70-80mins until cake is done. ( i bake at 170c for 1 hour wtih waterbath center oven. Removed waterbath continue bake lower rack for another 30mins ) Its perfectly cooked. * after removing cake from oven, wait for few minutes until cake pull away from pan to unmould. 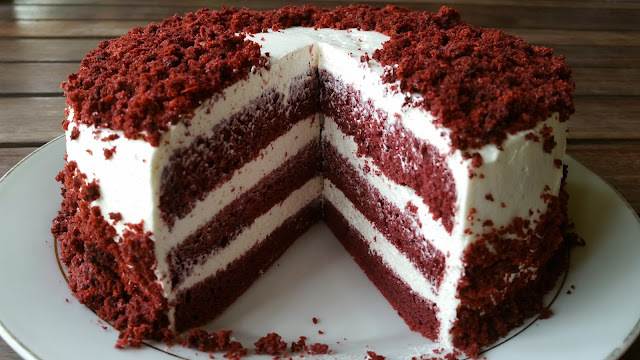 * allow cake to cool completely before slicing into 3 layers. Reserved top crust layer for decoration.